The latest Android distribution figures have been released, and they show that Android 6.0 can now be found on .5% of Android devices. That is up 67% from last month's .3% figure, which had Google's latest Android build installed on close to the same number of units as its ancient Froyo version. Now, there is some separation between Marshmallow and Froyo. Nothing to be terribly proud of we know, but it could have been worse. Android 6.0 seems to be slow in getting off the blocks. We might chalk this up to update fatigue. After all, the Android 5.0 and Android 5.1 updates seemed to take a lot of steam out of Android manufacturers. Speaking of Lollipop, Android 5.0 (16.3%) and Android 5.1 (13.2%) together have a 29.5% slice of the Android pie. That puts the previous-generation version of Android behind the 36.6% of devices running the more than two-year old Android 4.4 KitKat. After KitKat comes Jelly Bean with 26.9%. This build of Android encompasses Android 4.1.x, Android 4.2.x and Android 4.3. 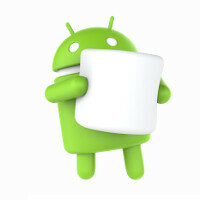 Gingerbread (2.3.3-2.3.7), Ice Cream Sandwich (4.0.3-4.0.4) and Froyo (2.2) round out the remaining builds listed, with 3.4%, 2.9% and .2% of Android phones running these versions, respectively. Looking ahead, Google has just released Android 6.0.1 to certain Nexus models. The new version of the operating system includes new emoji and some minor adjustments. C'mon Google/OEM's. Let's get that roll out going. My 5 is ready for some 6. Just slapped 9.2 on my iDevices, now I need some M.
I agree. MM has to be my favorite build so far. Doze and the app permissions overhaul are totally worth it. Full App permissions is one of the biggest things keeping me away from android. You can control the permissions with marshmallow, so how is that a bad thing? That is actually a great thing for users. Thus far MM has been very stable, no issues whatsoever aside form the Play store crashing on me 3 or 4 times (All within the first week and not since). You'll dig it when you get your update. The controll given to the user is pretty cool. M is shaping up to be a nice update. I just wish Google had a way to directly send updates to non nexus devices. The carriers take too long. Iphones get to the latest iOS update on .5% of devices probably within the 2 hours, if not a higher percent than that. Androids manage to do it in about 2 months lol. I'd like to see Google put their foot down on these carrier restrictions the way Apple does. Google needs to go vertical like Apple, and take that carrier control away. That would rock. I just wanna see the numbers for the Nexus devices...And maybe excluding non-flagship devices. IMO Google should ban OEMs making phones with older Android versions after the latest version is released. They cant ban them from Android but they can from google services. They should do this starting in 2016. If 10 users have windows mobile, 1 has win 10, but 100000 users have Android, but 10 out of them has MM.... Windows mobile is irrelevant with percentages. Android alone sold 300 million smartphones last quarter. Not to mention the new Nexus 5X and 6P only started to sell a month ago. Now Windows Phone / 10 mobile sold 5 million phones in the same quarter. Are you pay by Microsoft? Are they still recruiting? The interesting thing about Windows 10 OS for desktops is that people are not interested in upgrading to their latest OS while Google's Android people are frustrated that they cannot upgrade. It's so odd how things like that work. m.windowscentral.com/new-study-shows-more-people-l​ove-windows-10-hate-it Tons of people have been waiting and are enjoying W10. If Android was on PC, "frustrated" wouldn't even be the word. 70% of the global market qualifies for a free upgrade and Windows 10 still can't beat Windows XP in market share. That's why Microsoft has been force downloading the 3 to 6 GB update on user's computers prompting them to install the new OS. It's a sign of utter desperation. And as much of a joke that people think Chrome OS is, it now has more than 50% of the US market in public schools, and it's not slowing down. I love my Chromebook, and while I wouldn't be able to give up my Windows 7 desktop, I would switch to Ubuntu before going to Windows 10. You can continue trying out the trolling attempt at ignoring the main point and point out other "flaws"..but the point is that a lot of users want Windows ..hence their "interest" to upgrade. I wonder what excuses you'll come up with once out beats XP. Where are you getting your data from? Windows 10 has a bigger market share than Windows XP, OS-X and Linux. OS-X holds 9.36% of the market, Windows 10 holds 10.18% of the market, Windows XP holds 8.5%, Linux holds 1.5%, and Chrome OS holds .47% of the desktop/laptop market. There's no reason to update marshmallow, you can't tell difference between this and lollipop. Why would you want a storage hog update and end up getting more of the same interface, while 90% of the apps compatible jellybean? The Doze feature alone is worth the update, I've tried apps that mimicked it on Lollipop and they just didn't cut it. App permissions are also something that is awesome that Lollipop doesn't have. Then there's just the basic stability of the OS, just because the GUI doesn't look the same doesn't mean that it performs the same. Marshmallow is so much more stable than Lollipop. It also treats expanded storage like an extension of the internal storage. Built in file manager, do not disturb mode, modify the quick settings menu, Google Now on Tap... ... It's an update worth getting excited about.